All four Pinecrest Academy campuses are participants in the Nevada Ready 21 Digital Learning Program, which provides a 1:1 solution developed by the Nevada Department of Education and provided by CTL for grades 5-8 in the 2016-2017 school year. 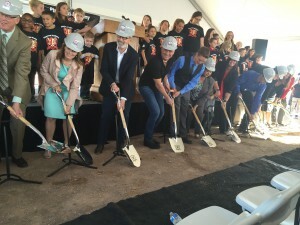 Pinecrest Academy of Nevada celebrated the groundbreaking of its fourth charter school in Henderson with a ceremony on March 31, 2016. The new school, scheduled to open in August, will initially enroll about 900 students in kindergarten through 9th grade. Named after the master-planned community in Henderson, Pinecrest Cadence will add a year of high school annually until it reaches the 12th grade. 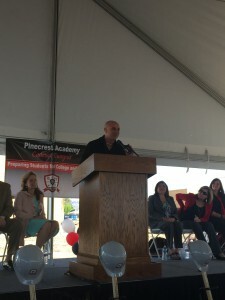 “The Pinecrest Academy of Nevada’s team of educators realizes that the vast majority of careers that our students will enter do not even exist yet. With this in mind, we provide the most innovative technology, labs, and STEM resources available. 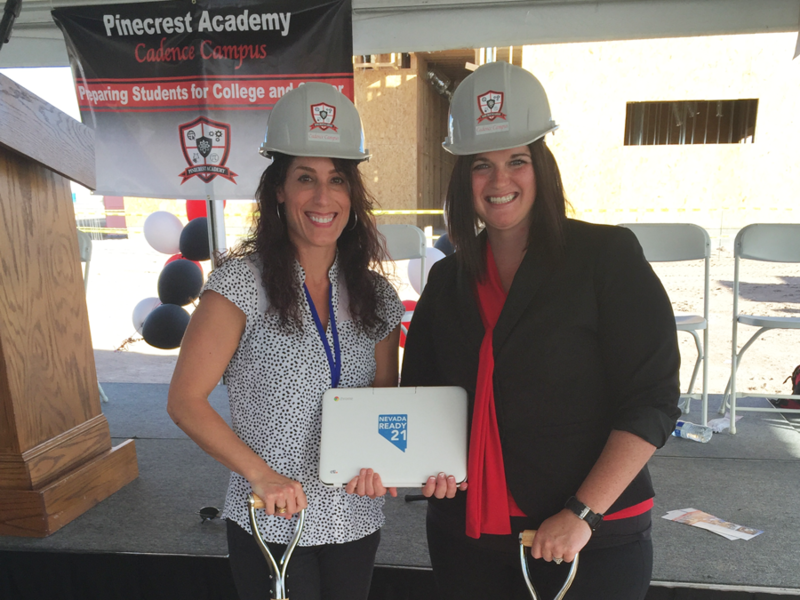 Our vision of using these tools in combination with family and community involvement to create a place for exemplary education has been realized at Pinecrest,” said Pinecrest Academy Cadence Principal, Jessica LeNeave. 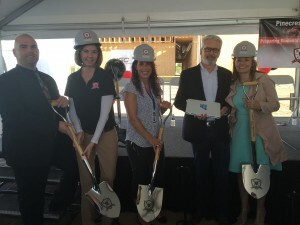 CTL Ed Tech Project Manager, Amy AL-Khalisi attended the March 31st groundbreaking ceremony. Amy will operate as a liaison between Nevada school districts and CTL as part of the Nevada Ready 21 program. CTL will provide Chromebooks, networking wireless infrastructure, a rich suite of apps and online tools and a robust package of service and support for the NR21 program. This program initially targets middle schools, while future phases will target high schools. All four Pinecrest Academy campuses are participants in the Nevada Ready 21 Digital Learning Program, which provides a 1:1 solution developed by the Nevada Department of Education and provided by CTL for grades 5-8 in the 2016-2017 school year. “We are grateful for the opportunities the Nevada Ready 21 grant and CTL are providing to our middle school community. This technology is going to open new electives and encourage higher participation in all of our blended learning offerings. We are truly humbled to be a part of this cutting-edge realization of the direction education needs to head to prepare our students for college and career,” LeNeave said. Nevada Ready 21 is a statewide initiative that provides students with an equitable, technology-rich education that supports high standards, an engaging learning environment, and the development of the 21st century skills students will need to fuel the economic growth of the state. Nevada Ready 21 ensures 24-hour access to a laptop for Nevada middle and high school students with the initial phase targeting middle schools. In addition to providing digital learning devices for each student, the program will deliver comprehensive professional development training and support for teachers and administrators as well as improving broadband internet access in schools throughout the state. CTL will provide Chromebooks, networking wireless infrastructure, a rich suite of apps and online tools and a robust package of service and support for the Nevada Ready 21 program. CTL will provide both face-to-face and online professional learning opportunities. Professional learning for teachers and administrators will begin late spring 2016 and continue throughout the program. Students will receive their new devices in the beginning of the 2016-2017 school year. Each student in the participating middle schools will receive a CTL Education Chromebook NL6, a ruggedized Chromebook designed specifically for education. Unique features include a retractable carry handle, reinforced ports and hinges, non-slip texture, anti-peel keys and 180-degree rotating camera.